I don’t know about you, but I have 5 tools that I consider my must haves when stamping beside the obvious paper, ink and stamps/blocks. The first tool on my must have list, is my Stampin’ Trimmer! This trimmer is by far the best paper trimmer I have used, and trust me, I have used several. 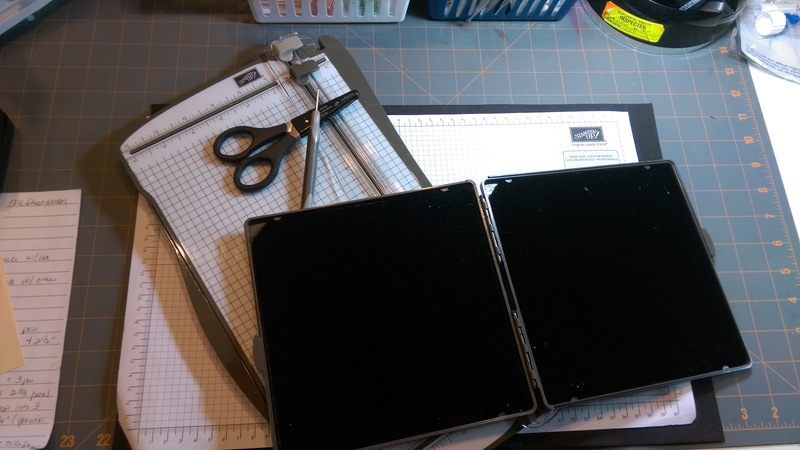 A few years ago, when I was first re-discovering my love of paper crafting, I went out and purchased a rather in-expensive rotary cutter. Ugh, the saying, “you get what you pay for”…I think it came from someone who bought this very rotary cutter….I couldn’t cut a straight line to save my life! It was awful! So, off to one of the big box office supply stores I went. There I found myself a rather pricy guillotine paper trimmer; that should work! Until I got it home that is….Immediately, when I pulled it out of the box, I could see that the swing arm was bowed out and sure enough, I couldn’t cut a straight line from that either! Finally, I decided to purchase the Stampin’ Trimmer. I was so excited when it arrived, but also prepared myself to be known forever to make crooked cards. I pulled it out of the box. It looked good. So, I pulled out an 8 ½” x 11” piece of cardstock and made my first cut at the 5 ½” mark, and there it was, a perfectly cut card base! It was beyond belief so I had to check it again….and sure enough, my eyes were NOT playing tricks on me! Wahoo! I found my new best friend in the craft room! The second “must have” on my list is the grid paper from Stampin’ Up! This is the perfect desk protector and allows me to ensure perfectly straight placement of sentiments, lines etc. The grid allows me to line everything up to ensure straight even designs. Remember…I can’t eyeball a straight line…see aforementioned love of the Stampin’ Trimmer! My 3rd “must have” in the craft room is my piercing tool. This little gem looks like it’s uses are pretty limited, however, it’s not just for paper piercing, mine gets used EVERY DAY, every crafting session. I use it to pick up rhinestones, pearls, candy dots, enamel dots, glue dots that need to be placed precisely. I use it to hold down corners that need a little extra glue drying time. I use it to hold down something I may be embossing with my heat tool to prevent burnt fingers…or should I say charcoal fingernails…that’s another story! The 4th most important item in my craft room is my Stampin’ Scrub. This is the best stamp scrubber I have used and it’s soft and gentle on your stamps while many out on the market tend to be rough and scratch up your stamps. And personally, I don’t think they would be very good for your lovely photopolymer stamps. In spite of being soft and gentle on your stamps, it does a great job cleaning them with the Stampin’ Mist. These 2 products together are dynamite! And when the scrubber gets too dirty to do the best job that it can do, it is easy peasy to clean…just pop out the fuzzy pads, run them under water, let them dry and you’re back in business! Don’t want to wait for them to dry 24 hours? Check back in a couple of days and I will share my little “trick” with you! You’re going to LOVE it! And finally, the 5th most important tool in my craft room is my paper snips! These little pointy scissors are an absolute must have in your stamping arsenal. They allow you to “fussy cut” with precision. They are comfortable in your hand, are great for trimming and cut ribbon like butter! So, there you have it, my top 5 must haves in the craft room. What are your must haves in your stamping arsenal?